During the month of March only, Soft Flex is offering an awesome book deal. You can get both of the lovely books shown above (one of them co-authored by me) for only $29.95! Show Your Colors is a new book by Soft Flex employees Jamie Hogsett and Sara Oehler. Show Your Colors explores beading designs infused with color. 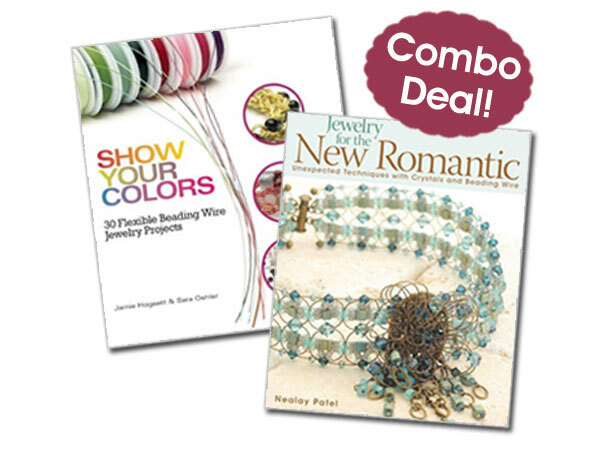 The book features 30 projects that use color throughout the jewelry creation, from the gemstones and beads to the beading wire itself. The designs are beginner friendly and unique enough that even the more seasoned beaders will enjoy creating them. Show Your Colors is the perfect accompaniment to our ten foot color spools as nearly every design in the book can be completed with a single spool. Think in color. Design in color. Show Your Colors! Jewelry for the New Romantic will guide you through creating ten beautiful jewelry sets; each containing a necklace, bracelet, and earrings. The book is filled with easy to follow instructions and clear illustrations. Learn how to create designs that incorporate color and edgy style along with traditional beading techniques. Most of the designs in this book were created with Soft Flex Wire. Don’t forget to buy what you need before embarking on your creative journey.